As a VIVAQUA client, you can easily receive, pay, manage, lock and archive your water bills in one central point on Doccle. 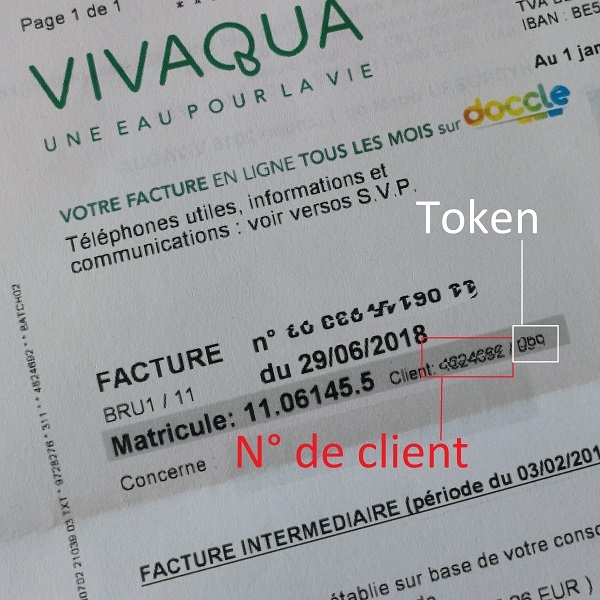 To do so, you need to connect to VIVAQUA in your Doccle account once by using your registration number (listed on the invoice) and birthdate. Now follow the step by step procedure and start immediately! This data can be found both on your water invoice. Select “Doccle Connect” and connect into your Doccle account or create a new account if you don’t have one. Did you receive an e-mail from VIVAQUA? From now on you can add VIVAQUA to your Doccle-account without entering any codes. Click on the Doccle Connect button from your e-mail. You can find your client number and your token on your invoice.